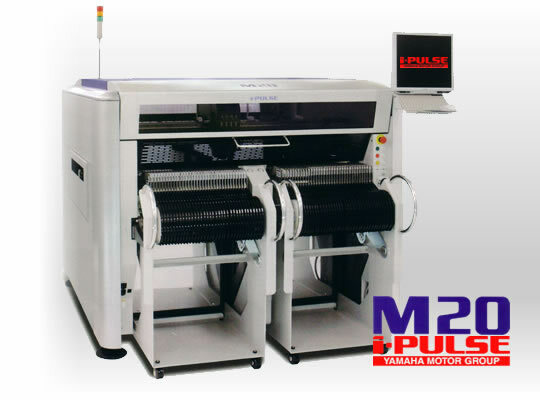 Amistar Automation is proud to offer the highly flexible line of mounters from i-PULSE, a Yamaha Motors Company. In the world of Factory Automation for Electronics, i-PULSE has become synonymous with Quality and Integrity. There simply is not a better-built machine available. These machines are rugged, versatile, highly flexible and efficient. All i-PULSE mounters use state-of-the-art Vision Processing. The software is straight-forward and simple to use. All machines come standard with many outstanding features that are typically ‘options’ on other brands. The i-PULSE machines are built to run – accurately and trouble-free – for a very long time. They require the least intervention for service of any kind, including maintenance, repair, or calibration. i-PULSE has won numerous awards from the Japanese Government for their manufacturing techniques and results. They are dedicated to provide the best equipment available. And Amistar Automation is proud to offer i-PULSE products in North America. The S20 is the newest offering from i-PULSE. It has the highest throughput of any i-PULSE machine to date – at 45,000 CPH (ideal conditions). The S20 is a single-gantry, single-lane mounter with 12 placement heads, capable of handling components from 01005 (0402 metric) to 120mm x 90mm, and maximum component height is 30mm. S20 can also handle Very Large PCB size, up to 1455mm (57”) x 510mm (20”) standard. Larger PCB size capability is available as an option. Force Control Function – which allows adjustment and measurement of the downward force applied to components being placed, from 5N to 60N. Board Warp Detection – The same lasers used for board detection for the Multi-Conveyor are also used to scan the board prior to placement to determine any irregularities in height, and then this data is used to adjust placement in Z. Automatic Nozzle Changer – handles up to 24 nozzles (40 nozzles optional). CAD Conversion and Optimization Software on the machine – standard. Raw data can be brought to the machine on a USB drive, and converted into a production program in minutes. On-Board Tools for Automatic Self-Calibration – the machine periodically ‘measures itself’ and updates its own parameters for any change in structure due to temperature or any other phenomena. It also uses a special tool to check and update the camera parameters, daily. These functions help to maintain machine specifications for accuracy and repeatability over the lifetime of the machine, without requiring machine downtime for intervention. S10 is a small-footprint version of the S20. 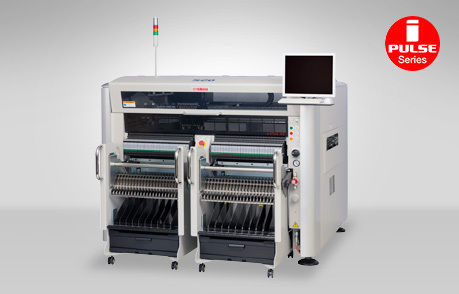 It has all the same capabilities for components and throughput as S20. Like the S20, the S10 is a single-gantry, single-lane mounter with 12 placements heads. But since it comes in a small footprint, it is ideal for use as a modular machine. By using multiple units in-line you can achieve Very High Throughput, and have the versatility of independent production on any part of the line. 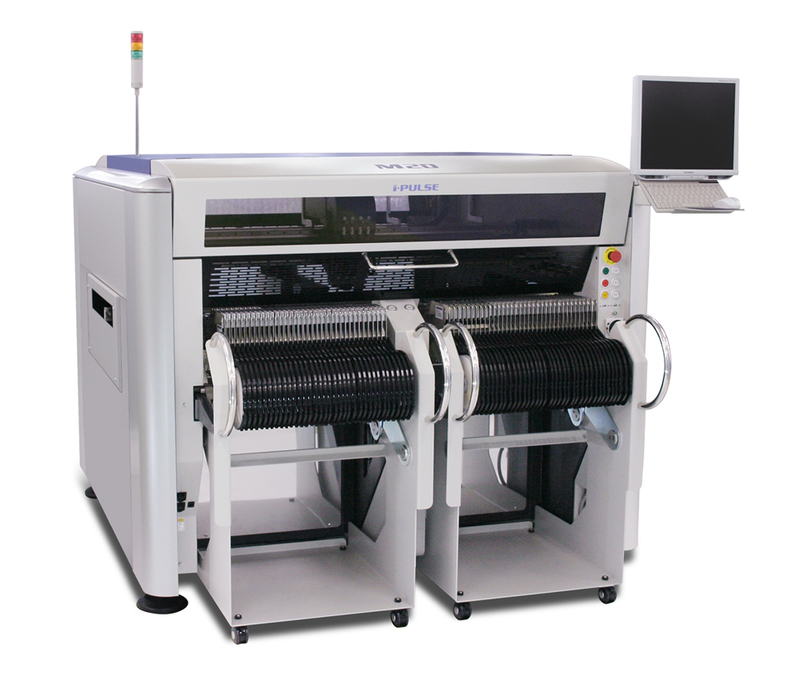 Although it is a small-footprint machine, it can handle PCB size up to 955mm (37.5”) x 510mm (20”) standard. Larger PCB size capability is available as an option. S10 comes loaded with all the standard features listed for the S20. The i-PULSE M20 is a very flexible and capable mounter with several hybrid functions available. It is a single-gantry, single-lane mounter available with 6 heads or 4 heads. It can handle PCB up to 1480mm (58”) x 510mm (20”) standard. Larger PCB size can be handled as an option. M20 can handle component sizes from 01005 (0402 metric) up to 120mm x 90mm, and maximum component height is 30mm. M20 is a standard footprint mounter – yet can hold maximum 180 feeders. It can be configured with fixed feeder banks or changeable banks for fast and easy changeover. Tape feeders are available from 8mm to 88mm, and feeders are available for tube or tray. With 6-head configuration, M20 is rated at 30,000 CPH (optimal conditions) and 23,000 CPH (IPC9850). With 4-head configuration, 24,000 CPH (optimal conditions), 19,000 CPH (IPC9850). M20 can be configured as a mounter AND dispenser. Any Placement Head can be swapped with a Dispense Head, to dispense solder, adhesive, potting material – and this can be done in under 5 minutes! Conversion back to Placement Head is just as fast – and there is no calibration or adjustment required. Board Warp Detection – The same lasers used for board detection for the Multi-Conveyor are also used to scan the board prior to placement to determine any irregularities in height – and then this data is used to adjust placement in Z. 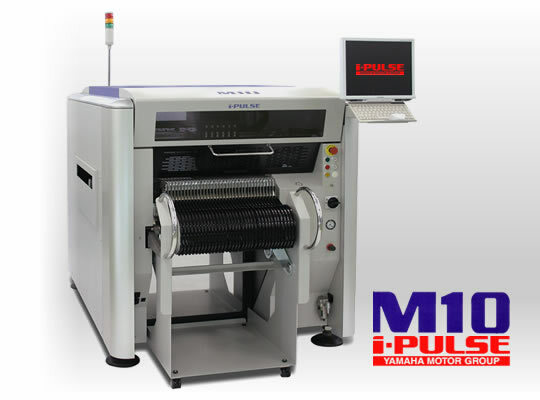 The i-PULSE M10 is a very flexible and capable mounter with several hybrid functions available. M10 is a small-footprint version of the M20. It has all the same capabilities for components and speed as M20. Like the M20, the M10 is a single-gantry, single-lane mounter with 12 placements heads. It is a single-gantry, single-lane mounter available with 6 heads or 4 heads. It is only 1250mm (49”) wide, yet can handle PCB up to 980mm (38.5”) x 510mm (20”) standard. Larger PCB size can be handled as an option. M10 can handle component sizes from 01005 (0402 metric) up to 120mm x 90mm, and maximum component height is 30mm. 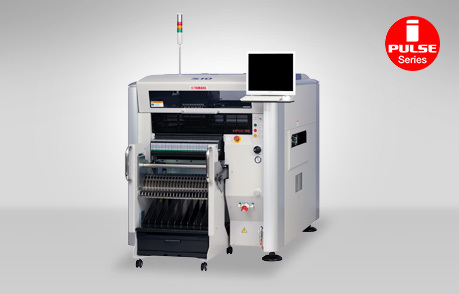 M10 is a small-footprint mounter – yet can hold maximum 90 feeders. It can be configured with fixed feeder banks or changeable banks for fast and easy changeover. Tape feeders are available from 8mm to 88mm, and feeders are available for tube or tray. With 6-head configuration, M10 is rated at 30,000 CPH (optimal conditions) and 23,000 CPH (IPC9850). With 4-head configuration, 24,000 CPH (optimal conditions), 19,000 CPH (IPC9850). M10 can be configured as a mounter AND dispenser. Any Placement Head can be swapped with a Dispense Head, to dispense solder, adhesive, potting material – and this can be done in under 5 minutes! Conversion back to Placement Head is just as fast – and there is no calibration or adjustment is required. M10 comes loaded with all the standard features listed for the M20. *We value your privacy. Your information will never be sold to or shared with third parties.